What Exactly Will I Learn? The Setup Wizard Didn’t Work! So far we’ve been turning LEDs fully on and fully off, but it’s also possible have LEDs dimmed to somewhere between on and off. And that’s what we’re going to do in this experiment: we’re going to use Pulse Width Modulation (PWM) to create a dimming effect on an LED. 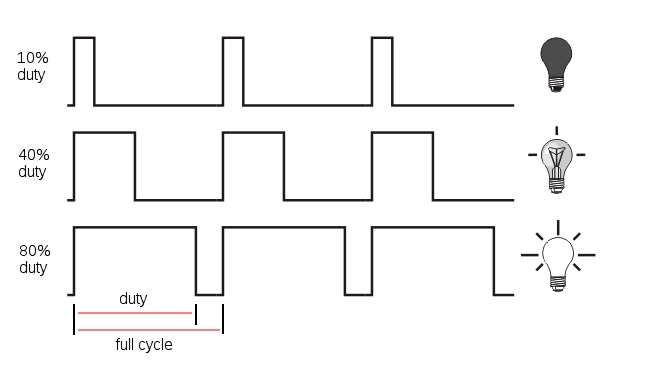 Pulse Width Modulation (PWM) is a technique of producing varying analog signals from a digital source. Digital signals can only be either HIGH or LOW, where the HIGH voltage is some fixed value depending on the circuit. On the Omega, HIGH on the Omega is 3.3V. On the other hand, an analog signal can be any voltage between HIGH and LOW. Normally, digital circuits can’t freely vary voltage signals, but they can use PWM to get close enough. It works by repeatedly pulsing a HIGH digital signal on and off so that the average voltage coming from the circuit over time would be equivalent to an analog signal between HIGH and LOW. To change the analog voltage, you can vary how fast the HIGH signal is pulsed. There are some limitations to this method depending on how the driving circuit is built, but it’s relatively simple to implement and can be accurate enough for most cases. 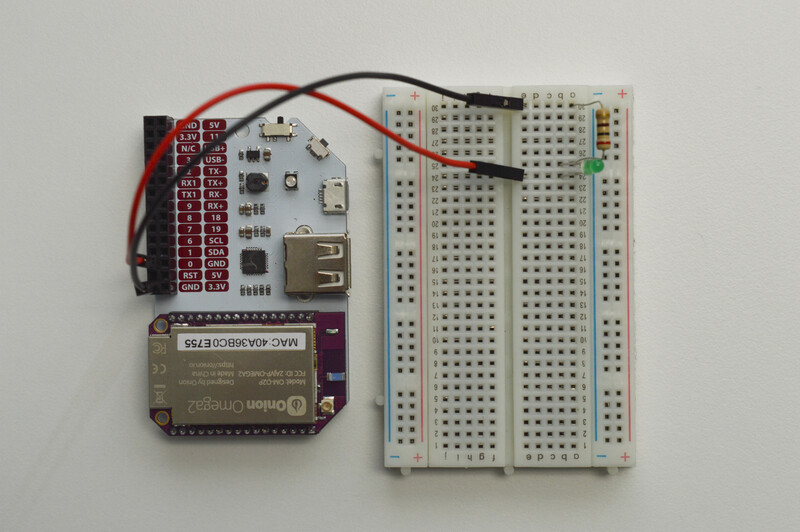 By sending a PWM signal to an LED, we can control how bright that LED appears to shine. What’s actually going on is that the LED is turning on and off many, many times in a second. For example, if we send a 50% duty cycle PWM signal at 50 Hz to an LED, it will be on for 10ms, then be off for 10ms, then be on for 10ms and so on. You won’t actually see the LED turning on and off, instead you’ll see that the LED looks much dimmer than when you set the duty cycle to 100%. We’re going to be providing power to the LED just like we did in the two previous experiments. The only difference is the speed at which we turn the LED on and off, and that will be taken care of in the software! Plug in the LED into the breadboard, make sure you plug the anode and cathode into different rows and that you know which is plugged where. Now connect one end of a 200Ω resistor to the the cathode row, and the other end to an empty row. Connect the other end of the resistor to a Ground pin on the Omega2. Let’s choose GPIO0 on the Omega2 to drive our LED, so connect a jumper wire from GPIO0 to the LED’s anode. Let’s get to writing the main code. This time, we will be using fast-gpio, a utility we created to quickly control GPIO signals from the command line. However, we can also call this utility from within a Python script! We’ll use the PWM functionality of fast-gpio to slowly increase the LED’s brightness by incrementing the duty cycle on its GPIO, then slowly decrease the brightness by decreasing the duty cycle. You’ll be seeing the light gently fade in and out. See the Omega2 documentation for more info on fast-gpio. When you run this script your LED will fade in and out. This is because we set the duty cycle to increase up to 100% (fade in to 100%), and then we begin to decrease the duty cycle down to 0% (fade out to 0%). The code this time is quite different from the previous two experiments. Instead of using Python classes and objects, we are calling a command-line program from within the script. We then wrapped this call in a Python function to make it easier to reuse. In our infinite loop, we increment the duty cycle by the brightnessIncrement, and at 100% we reverse the value and decrement to 0.
fast-gpio works by setting GPIO registers directly on the processor and is a very fast process. It is fast enough that it can be used to generate PWM signals (this is known as software PWM). In order to use fast-gpio, we need to use the os module. This module allows us to send command-line arguments in Python using os.system(command), where command is a string containing the arguments you would normally type in the terminal. This is known as a system call. By doing this we make it really easy to reuse for other pins, frequencies, and duty cycle values. Whenever you have problems that require identical commands to solve, it’s good practice to write your commands once in single functions that can be called wherever they are needed. Next we’ll learn how to read a switch.